Total Weight Gained? : Keeping steady at 180lbs. That means I've gained 39lbs this pregnancy, a full 10lbs less than what I gained when pregnant with Carter. My goal was to gain less and I'm so glad I did. It's official. The Little Greek Doctor measured my belly this morning (measuring a full week ahead, as usual) and said that Maclane will most likely be as large as his big brother. Now, keep in mind the doctors thought Carter was going to be " an average 7lbs" and he popped out a whopping 9 lbs. 10 oz. at 39 weeks so I do find small reassurance in the estimate that Maclane will be large like his brother. I still don't think I look as large as I did during my pregnancy with C, so I'm thinking Maclane will weigh in around 9 lbs 1 oz. I'm as excited to find out how much he weighs as I am to meet him! Sleep: Could be worse, right? 2-3 hours at a time before I have to change positions or tinkle. Pretty soon it will be 2-3 hours before I have to feed a brand new, squishy baby! Might as well get used to it now. Best Moment of the Week? The nursery is finished and I've shared M2's name! Well, except for shades, the nursery is complete which means I will be revealing it on the blog later this week! I absolutely love how it came out and I'm so thrilled to have shared M2's name with you all. I also absolutely love that so many of you are just as excited to "meet" him as we are! Thank you, thank you! Belly Button: I never thought my turkey-thermometer of a belly button could ever turn flat, but turn flat it did! Even The Husband poked fun at it this week. Labor Signs: Contractions tend to strike in the evening, just as I'm settling in on the couch to relax. Nothing exciting- maybe 6 or 7 an hour, 6-9 minutes apart on average- but they typically seem to fizzle out after that initial hour or so. But darn, do those suckers hurt! No progress, of course. I was checked at 38 weeks and my cervix was hanging out in my throat (where Maclane also happened to be hanging out)- so I declined any further checks. My body is labor-retarded and I'm OK with it! Movement? Uncomfortable but he's still going at it. He's so big that we're able to define exactly which body part is moving across my belly; arms, hands, feet, etc. I can't wait to kiss and nibble those fingers and toes! What I miss? Beer. Skinny clothes. Sleep. Walking like a normal human being and not waddling/walking like I have a giant stick shoved up my tush. The ability to bend over. The ability to walk up and down a flight of stairs without having to take a break halfway between the top and bottom. All of those things and then some. What I'm looking forward to: Celebrating Father's Day and our "last weekend as a family of three!" My parents will be coming into town on Sunday and we'll be throwing a backyard crab feast (in honor of my Dad and The Husband) and I'm looking forward to relaxing and soaking it all in! Okay so can I admit that this post made me a little teary? I don't think there's anything more exciting than waiting for a new baby to arrive. You're making me excited for #2 which is not even on our radar yet... yikes! Do strangers ask you if you're having a boy? My belly looked like yours (okay, I didn't look nearly as good as you, but the same general shape), and people would stop me in stores, elevators, etc. to say, "WOW YOU'RE ALL BOY HUH?" Um yes, nice to meet you too? So cute! You look great :) Can't wait to "meet" M2. Happy, healthy vibes comin' your way. EEEKKKK this is the last bumpdate! I cannot believe it!!!!!!!! You look amazing mama! Love the bump pictures! 5 days...AHHHHH! You look AWESOME! I hope I look that good at 39 weeks! I am at 23 and feel like a blimp. no more bumpdates!! can you believe it?!? the next update will be all about him!!! gah!!! SQUEEEEE sooo cute!!! Can't believe you're 39 weeks!! Almost there mama! Seriously I feel like you've been pregnant forever because I've known for so long...so I can imagine you feel the same way! :):):) I can't wait to see sweet Mac's face. You look so cute! Can't wait to hear that Maclane is here! You look fabulous AP!! Seriously. I can't believe he will be here in just a few short days! I can't wait to "meet" him! And I love love his name! I just love your bump, it is awesome!! Can't wait to see the nursery!! Ahhh you seriously have the cutest pregnancy belly ever!!!! You are ALL belly! At 9 weeks I feel like a tank and I know it's not even freaking baby, just bloat! I can't wait to hear all about little Mac's arrival! Sending prayers your way! I think I might have just teared up in this post. Sniff sniff. Can't believe he's so close. So thankful for his little life already. You look amazing! Soak up this weekend and ENJOY having family in town! I know y'all will have a great time! You look wonderful! Can't wait to "meet" him!! So do you actually see a hand or foot print pressing against your belly? I always wanted to with my twins but it never happened. If you can, that's so cool! Cannot wait to hear more as you are in the final stretch for M2's arrival. Maclane has such a good momma! Sooooo close and you do look so adorable! So excited for you and can't wait to see the nursery reveal! Enjoy your last weekend as three! Cannot wait to "meet" baby Maclane... So close how exciting!!!! Enjoy your last weekend as a family of three!!! I am kind of freaking out with excitement for you...Maclane will be here SO SOON! If I could drive from Tennessee to Maryland and deliver you an adult beverage AT the hospital, I totally would. I can't wait to have a big ol' glass of wine in August! Looking good, sistah, looking good :) Enjoy these last sweet days as a party of three! I cannot believe he is going to be here so soon!!! You look great! So excited to "meet" Maclane!!! 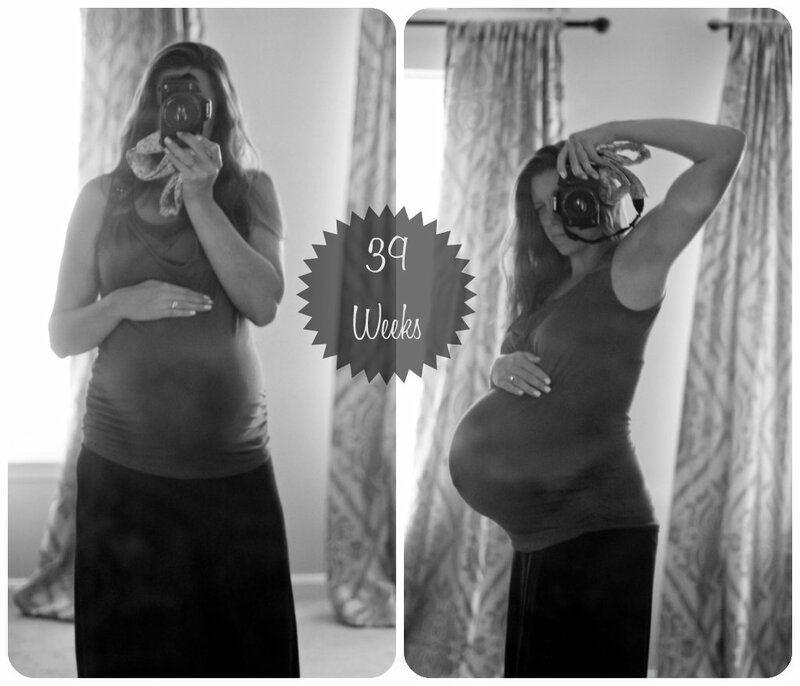 you look amazing at 39 weeks! i'm totally with you on missing beer, skinny clothes and the ability to bend over. only i still have another 10 weeks to go. You look great! Can't wait to see baby Maclane's room and of course see him! You look great, and I'm so excited to see the nursery photos later this week. Can't believe the time has come!! You look amazing!!! So excited for you! Good luck with the labor. I can hardly wait to see pics! Eeeek, you look soooo good!!!!!!!!!!! I can't believe Maclane is almost here! So exciting! Oh.my.gosh he will be here so soon. Dying. You look great! I think there's definitely another big baby in there! You look wonderful!!! Yeah for MacLane!! Sounds like a perfect last weekend to me!! And, beer is in your VERY NEAR FUTURE my friend. So thrilled for you all!! 1. EVERY single ounce you've gained is in that belly. Seriously, I agree with other commenters.... every single pound is in that belly! You are so beautiful!